Racing experience, industry knowledge, and professional collaboration have led Venture Heat to create the ultimate motorcycle heated glove, the Heated Carbon Street Heated Gloves. Designed with the sports bike enthusiast in mind, they provide superior comfort, protection, and ergonomics for the best cold weather riding experience possible. 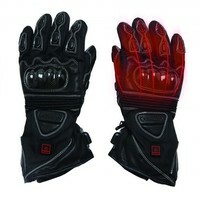 Powerful heating elements woven into the winter motorcycle heated gloves create noticeable warmth in under 10 seconds by simply touching the built-in temperature controller and switching through three different heat settings.